PunchTown modeled these beauties after professional gloves to prepare you for war in the cage, but they added several features for safer everyday training. There's an extra ounce of high-impact padding over the knuckles so you can throw strikes confidently. The thumbs on these open-palm style gloves are padded to protect you and your training partners. Ample wrist support is offered by the adjustable hook-and-loop strap. Top quality genuine leather on the outside, with a smooth moisture-dispersing lining on the inside. 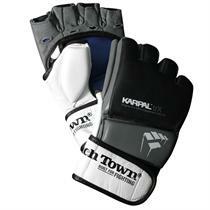 Email your friend about the PunchTown Karpal trX Pro Style Fight Gloves. Ask a question about the PunchTown Karpal trX Pro Style Fight Gloves.